The defending national champion Ohio State Buckeyes closed-out Week 1 of the 2015 college football season with an impressive 42-24 victory over Virginia Tech on Monday night after closing as 13.5-point road favorites on 5Dimes’ closing betting odds. The results for the Big Ten as a whole in Week 1 were mixed with a straight-up record of 8-6 and an even mark of 7-7 against the spread. The total went OVER in nine of the 14 games played. The biggest upset in the conference came at the hands of Penn State in the Lions stunning 27-10 loss to Temple as six-point road favorites. Michigan State was the next highest ranked team in the nation after No. 1 Ohio State heading into the new season and while the No. 5 Spartans went on to beat Western Michigan 37-24 they could not cover as 16-point favorites on the road. Turning to this week’s action, the top game in the Big Ten pits Michigan State at home against the Pac-12’s Oregon Ducks in a battle between two Top 10 teams. The Spartans have been listed as 3.5-point favorites in this contest with the betting odds on the total set at 68. The Ducks come into this game with a 9-2 record against the spread in their last 11 games and they are 19-7 ATS in their last 26 games on the road. Michigan State is 7-2 ATS in its last nine home games and the total has gone OVER in its last seven nonconference games. Another Pac-12/Big Ten matchup this Saturday sends the Oregon State Beavers on the road to face Michigan. The Wolverines under new head coach Jim Harbaugh stumbled out of the gate with a 24-17 road loss the Pac-12’s Utah Utes as five-point underdogs. The betting line for this Saturday’s game has them favored by 15.5 points at home with the total set at 48. The Beavers opened their season with a 26-7 victory against Weber State, but they failed to cover as 28.5-point home favorites to fall to 2-7 ATS in their last nine nonconference games. Michigan is 4-0 ATS in their last four games following a SU loss and the total has stayed UNDER in five of their last six home games. I went against Purdue last week as a seven-point road underdog against Marshall and cashed-in on the Boilermakers’ 41-31 loss. This week I am locked-in on Saturday’s Iowa at Iowa State game as my top Big Ten pick. The Big Ten’s Hawkeyes upended Illinois State 31-14 in their season opener as 10-point home favorites. They rolled-up 431 yards of total offense in that game including 210 yards on the ground. LeShun Daniels Jr. carried the load with 123 yards rushing on 26 carries. The Cyclones also tallied 31 points in a 24-point victory over Northern Iowa as 13-point favorites at home. Quarterback Sam Richardson had a big day with 233 yards passing and two touchdown throws. With the lead sitting at just three points at the half, Iowa State went on to score 21 unanswered points in the second half. Iowa comes into this in-state showdown as a 3.5-point road favorite, but it is just 1-4 ATS in its last five games against the Big 12 including a shocking 20-17 loss to Iowa State last season as a 13-point home favorite. 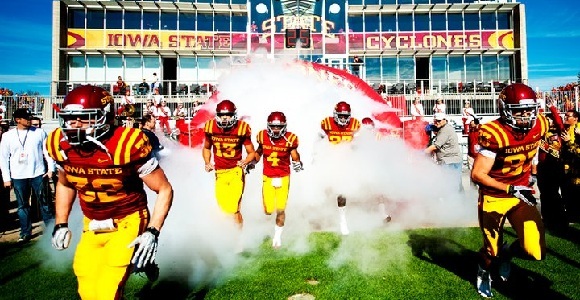 Normally you would look for the revenge factor to play a part in the rematch, but the Cyclones have been a solid bet playing the Big Ten with a 14-4 record ATS in their last 18 games against this conference. I am riding that trend again this Saturday with the play on Iowa State plus the 3.5 points.